This post was created in partnership with Very Lazy. Over the past year I have been messing around with a slow cooker. 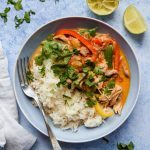 I’ve tried so many different slow cooker recipes, started developing some of my own – which I will be sharing with you shortly – and had some truly epic failures that had to go right in the bin. 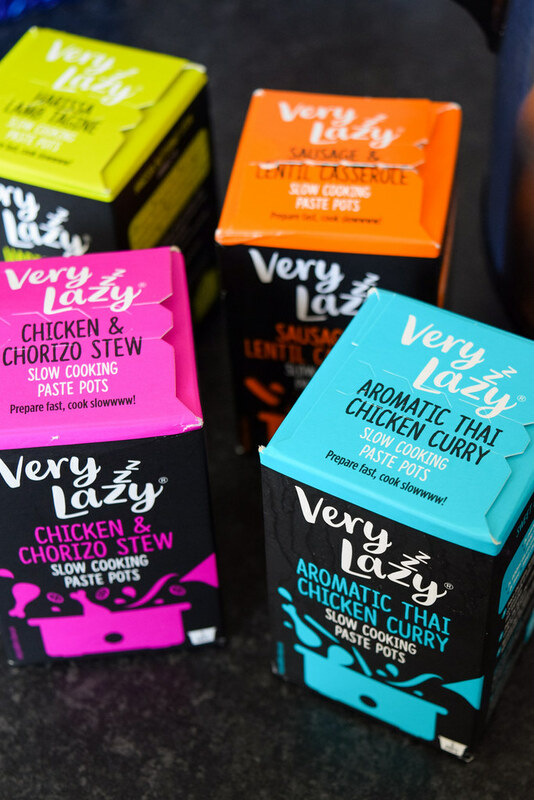 However, today I want to talk to you about something new which I think makes the perfect introduction to your new slow cooker if you don’t know where to start with it: Very Lazy’s Slow Cooker Paste Pots which are exclusive to Tesco. Very Lazy are the people who chop up your ginger and garlic for you if you don’t like getting smelly fingers, and who make lemongrass paste which is an utter life saver – you’ll know this if you’ve ever tried making a curry paste out of lemongrass yourself, which is something I have basically given up on! 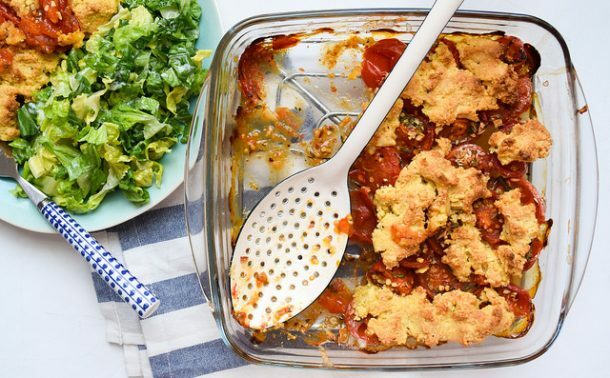 Basically, they’re little helpers for your slow cooker flavours. 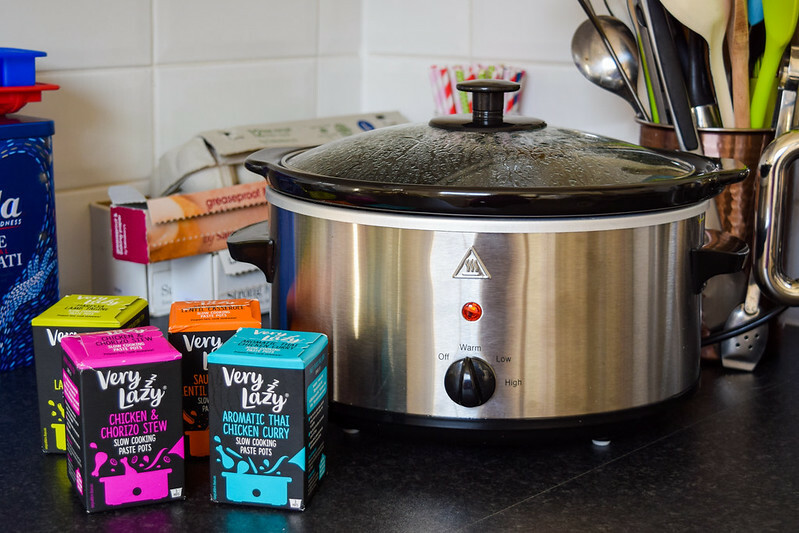 One of the hardest things about working with a slow cooker for the first time is getting liquid and flavour volumes right, and these pots take out the guesswork with pre-mixed flavour pastes and easy to follow meaty and veggie recipes on the side of the box: the perfect introduction to your slow cooker! Usually I like to make my stews and pastes totally from scratch, but as mentioned above I never bother when it comes to curry pastes, so obviously I pounced on the Aromatic Thai Curry Chicken Curry paste pot as soon as it arrived – my recipe below is based on the one on the side of the box, but boosted with some extra veggies and a savoury, unami hit of Thai fish sauce. 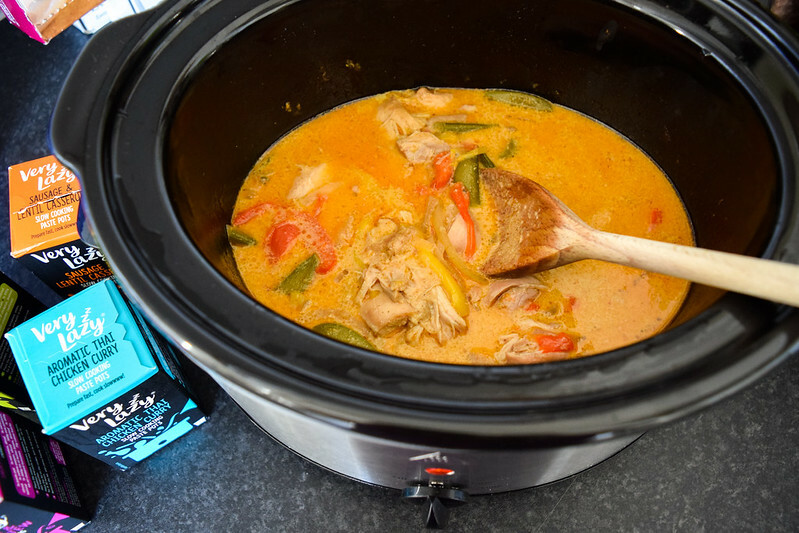 I’ve included directions below to cook your curry on high and low, depending on if you’re putting it on during the day to enjoy after a Saturday afternoon out, or first thing in the morning to enjoy once you get back from work. 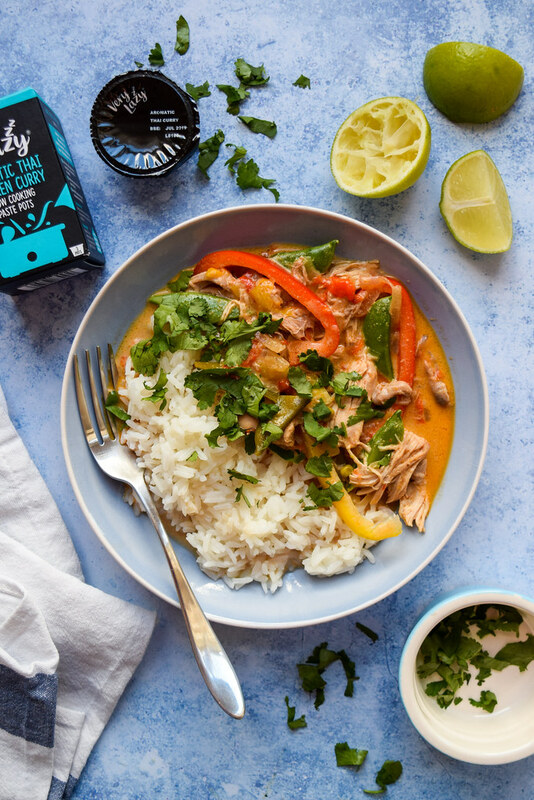 Regardless, be sure to serve it with a mountain of fluffy, aromatic jasmine rice, wedges of fresh lime for squeezing and mountains of fresh chopped coriander to scatter liberally over each bowl. 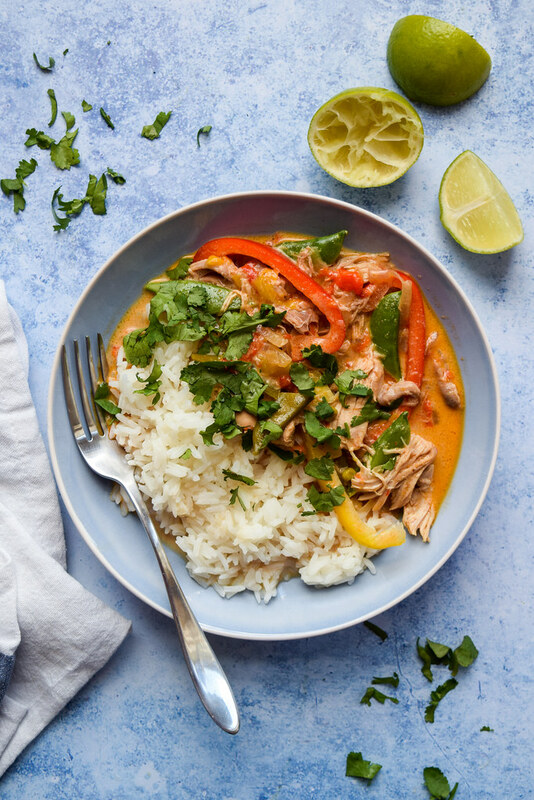 This easy Thai red chicken curry made in the slow cooker is really as easy as just chopping up a load of ingredients, throwing them together and waiting for them to be ready! 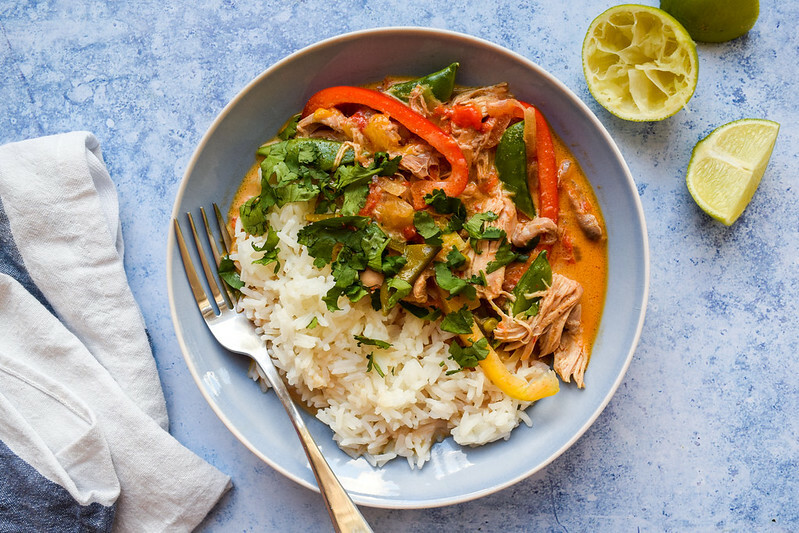 Combine the coconut milk, Very Lazy Slow Cooker Thai Chicken Curry Paste Pot, chicken thighs, peppers, onion and sugar snap peas. 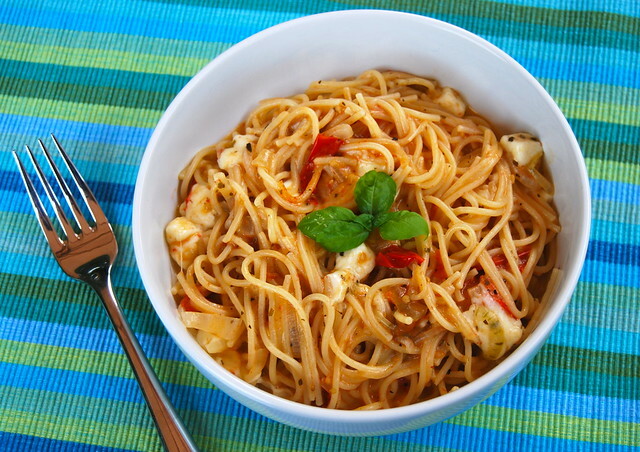 Cook in your slow cooker on low for 8 hours, or 4 on high. Stir in the lime juice (you might want to add a little bit extra, to taste) and the fish sauce. 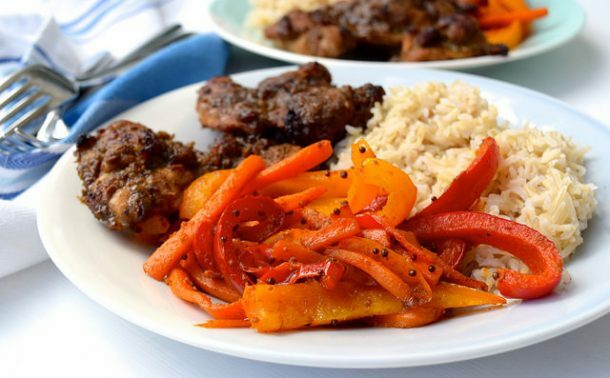 Serve over jasmine rice with fresh coriander and lime wedges.